In 2016, parts of Ethiopia were severely affected by two consecutive failed rainy seasons - the spring rains (belg), and the summer rains (kiremt), due to the effects of the El Niño weather patterns, which led to a longer drought period in the north and north east of the country, and severe flooding in parts of the south and south east. As a result, large areas of the country faced a devastating drought, leaving more than 10 million people hungry and in need of food aid. Our country representative in Ethiopia, Patricia Wall said: "Ethiopia faces a food shortage that has left millions hungry. With our local partners, we are already on the frontline getting assistance to where it is needed most." The United Nations described the situation as: ‘acute need, exceeding levels seen in the Horn of Africa drought of 2011’. The drought is expected to continue into late 2016. 429 districts or counties out of 700 in Ethiopia - over half the country - were classified as hot spots in the government’s drought-monitoring programme. 10.2 million people were in need of emergency food. 1.5 million children, pregnant and breastfeeding women were in need of supplementary feeding, of which more than 400,000 children required treatment for acute to severe malnutrition. 2 million people were in need of emergency water, sanitation and hygiene. Your donations helped our partners reach more than 285,000 people affected by the drought. Where did CAFOD respond to the Ethiopian food shortage? 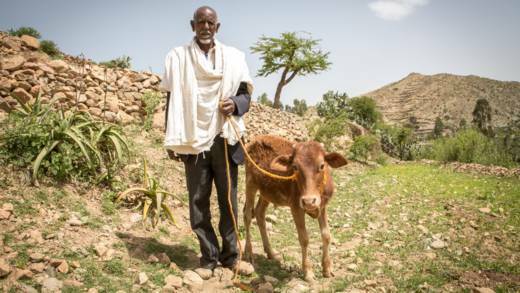 In northern Ethiopia - Tigray Region - Direct cash transfers were given to the most vulnerable households in communities, giving them the ability to buy food in the local market place. We also provided cash for work activities; such as soil and water conservation schemes, creating access to water points. For these activities we worked with able-bodied men and women, taking into consideration their physical and psychological well-being, and dependent on each person’s ability to take part. This paid work allowed families to buy basic foods. In addition, local partners supported families with seeds and livestock feed. In north eastern Ethiopia - Afar Region - We worked on water and sanitation projects such as the construction of new water points, and the expansion and rehabilitation of existing water points. We also supported hygiene promotion and access to sanitation through Adigrat Diocese Catholic Secretariat. Our partners supported 3,717 households affected by the drought, equivalent to 15,000 people. They were also planning to reach 25,000 people with access to clean water. In central and southern Ethiopia - We worked through two Catholic and one government health clinics experienced in working on nutrition – helping under-fives, pregnant and breast-feeding women in Hosanna. We also supported the Diocese of Soddo with emergency seeds in the SNNP region. Further south in Borena zone of Oromia Region we worked with partner Action for Development (AFD) to support pastoralist communities. What were the humanitarian needs? Malnutrition - According to the National Disaster Risk Management (NDRM) and the UN Office for the Coordination of Humanitarian Affairs (UN OCHA) as of 10 May 2016 moderate to acute malnutrition levels increased from 1.7 million to 2.5 million, as mothers and their babies’ arrivals increase at therapeutic feeding clinics. Farmers - More than 85 per cent of the population live in rural areas as subsistence farmers cultivating rain fed agricultural crops, such as barley and wheat. During a good season, farmers would be able to grow enough to last into the next planting season. But the drought meant that any reserves they may have had, were gone. Pastoralists - The failed rains caused scarcity of pasture and water for livestock, and consequently many animals died. For pastoralist communities, livestock are like a living bank, so families also require fodder to keep their animals alive. We worked with the Ethiopian Catholic Church, members of the Caritas network SCIAF (Scotland) and Trócaire (Ireland), and local secular partners. Our partners reached vulnerable people in communities, and were able to save lives with the emergency aid that families need. Where did the money from the East Africa Crisis Appeal go to? Money raised from our Ethiopia Food Crisis Appeal went directly to Church, national and local partners. Our experienced partners were already on the ground responding to the needs of vulnerable communities and are best placed to know how to support families. What is the Ethiopian government doing? The Ethiopian government launched a national effort allocating nearly $200 million (£130 million) to deal with the food crisis. But with more than 10 million people - a tenth of the population - affected by failed harvest and in dire need, the situation required national governments, donors and the humanitarian community to immediately come together to coordinate an emergency response. How long has CAFOD worked in Ethiopia? CAFOD has been supporting long term development programmes and emergency work in Ethiopia for more than 30 years, establishing strong partnerships with the Catholic Church, other faith organisations, national and local partners. El Niño - a Pacific Ocean warming occurring every two to seven years - is said to be the cause of this current drought. Scientists believe they have been around for millennia, but that droughts and floods they trigger may be becoming more intense as a result of climate change. Is this all to do with climate change? Every day, we witness the effects of the changing climate on poor and vulnerable people around the world. Communities we work with are losing their crops due to erratic rainfall or warm temperatures, and families are struggling as water sources disappear. This makes communities more vulnerable to poor harvests and droughts, and has contributed to this food crisis. In Pope Francis’s Encyclical – Laudato Si’, he speaks openly about the devastating effects of climate change on people and the planet. He says that climate change is real, urgent and it must be tackled. He also describes the climate as "a common good, belonging to all and meant for all". Will CAFOD be responding to other parts of the East and Horn region of Africa, and Southern Africa, affected by drought? We are a member of Caritas Internationalis - a confederation of 165 Catholic aid agencies across the globe - and many of our sister agencies in the Caritas network are already on the frontline in places like South Sudan, Kenya, Somalia and Zimbabwe, providing vital aid to communities affected by drought. Please support our emergency response to this crisis today and help us reach people in desperate need.